The PURA UV Sterilization System with whole-house filtration provides your home or cottage with clean, great-tasting water that you can rely on. UV is proven to control microbiological (bacteria & virus) issues in water including E.coli, Cryptosporidium, and Giardia Lamblia without the use of chemicals. 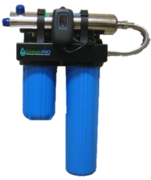 Combining UV disinfection with whole-house sediment and/or carbon pre-treatment filters improves UV performance and the taste, smell and clarity of your water.